A few weeks ago, Harlow’s teacher sent out an email asking for family photos, to which I gladly obliged. As you might know, I have a ton of family photos. Yesterday, I walked into class and all the photos were hung up on the wall, next to watercolor paintings that the kids had made to represent their families. The families were of all different colors and sizes, but the one constant was that everyone was smiling and huddled in close with the ones they love. In the middle of the wall was the question, “What is family?” This question was surrounded by a myriad of answers that I assume came from a class discussion— mom and dad, two dads, two moms, one mom, one dad, siblings, no siblings, pets, grandparents, etc. 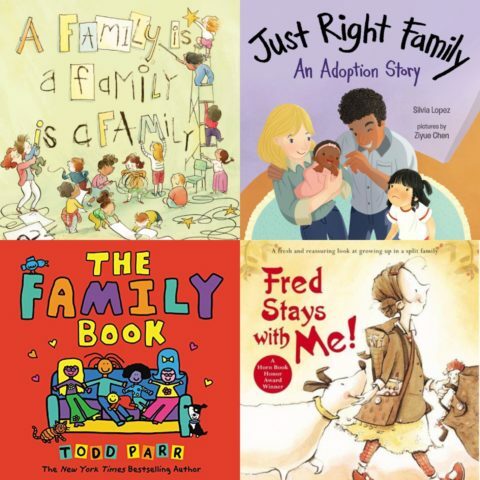 The broad meaning of “family” is a big focal point of the kindergarten curriculum at Mazzy and Harlow’s school, which I think sets the tone for both self acceptance and acceptance of others. The lesson is that there is no one “right” way to be a family, which is very important for kids to recognize at an early age. How we love this special story about a girl with two dads! Young Stella is distraught when her class prepares for a Mother’s Day celebration- since she doesn’t have any moms, who will she bring to the party? With the help of some of her classmates, Stella realizes she’s got a whole crew of people who love and support her — and she just might have to bring them all! There are so few stories about divorce that aren’t didactic or heavy handed. This one follows a girl learning to navigate her new life with two homes and going back and forth between them. Her dog, Fred, goes back and forth with her, providing stability for the girl and common ground for the parents. The dog also provides an avenue for the parents to learn to resolve conflict. A nice story that is simple and not overly sentimental or sappy. This beautiful adoption story about a multiracial family hit all the right notes for us. Melli’s parents adopted her from China, and now they are ready to bring home another baby girl: from Haiti! Melli, though, thinks her family is just right as it. This tender story of love and learning is a wonderful journey as it beautifully conveys how open Melli’s family is about Melli’s own adoption and how they will welcome a new baby from another country and background into their home. Two moms? Two Dads? Single parents? Multiracial families? Big, small, clean, messy? Todd Parr’s vibrant, simple books are perfect for young readers. And this one, especially is one of our very favorites for it teaches children to appreciate our differences and the beauty of diverse families. As long as there is love, nothing else matters. This is the kind of family book that should be in every classroom and on every child’s bookshelves around the country! When a bulldog family and a poodle family meet in the park, this chance encounter reveals there has been a mix-up among the pups. No wonder Gaston, a bull dog, does not look like his siblings! The mothers decide to switch the two puppies, but all quickly realize this may not have been the right decision. Without feeling heavy handed, this book explores family relationships and demonstrates that, more than anything, family is built on love. Physical appearances do not mean everything (rightly so), and though one may be able to find some commonalities with others who may seem more outwardly “similar,” home is with the ones that nurture and love you, above all else. I love this beautiful, non-fiction book about the Lovings and their fight to make interracial marriage legal in every state across America. Richard (a white man) and Mildred (a black woman) fell in love and got married – yet, marriage between people of different races was illegal in Virginia and they were thus forced to marry in DC. After their marriage, the police barged into their Virginia home and jailed the couple, prompting a fight against the unfair law that ended up before the Supreme Court — where the Lovings won. A fabulous introduction to the Lovings and the fight for marriage equality. This is the true story of two male penguins living at the Central Park Zoo who became a family. Roy and Silo were two male penguins who were inseparable. Though different from the other penguins in the zoo, they had a clear desire for a family. Thus, zookeepers gave the penguins a motherless egg, and the two successfully hatched baby Tango. A beautiful, poignant story to show that a family is a family, no matter what it looks like. Alex has two homes, one with mommy and one with daddy. She also has two bedrooms, two comfy chairs, and friends to play with at each house. Despite the fact that Alex’s parents are divorced and she has two of everything, one thing remains constant, no matter where she is: she is so very loved. For children of divorced families, this reassuring book addresses the things children gain during a divorce – and the things that will never change when parents separate. What happens when your parents adopt a new baby, but the baby happens to be a wolf and not a bunny like the rest of the family? Mom and Dad are so smitten, and the daughter bunny, Dot, is the only one who realizes that Wolfie may eat them all up! This take on sibling rivalry and overcoming differences is spot on — leaving readers young and old entertained, enlightened and laughing in stitches. I love the way this book explores the power of “one” – that the number one possesses a whole slew of different meanings. “One” can truly encompass a whole multitude of numbers – one box of eight crayons, one batch of ten cookies, and one family – no matter how many people it includes! This book uniquely shows, through a wide array of multiracial and multi-generational homes, that “one family” means something special to each of us and can contain any number of people. Thanks for this! I have been looking for this exact thing. I realized recently all my daughters books with families in them look exactly the same (white, mom and dad) Really need to change that!